Elia Arce is an internationally known artist and cultural activist working in a wide variety of media including performance, experimental theater, film/video, writing, spoken word and installation. She is the recipient of the J. Paul Getty Individual Artist Award, The Rockefeller Foundation, the National Endowment for the Arts, The Durfee Foundation and a 1999 nominee for the Herb Alpert/CalArts Award in Theater. Since 1986, she has been creating, writing and directing experimental theatre works-in collaboration with HIV positive immigrants in Houston, breast cancer workers in Washington DC, house-keeping staff in Banff, Canada and the homeless of L.A.’s Skid Row. In 1993 she created her first full-length solo performance: “I Have So Many Stitches That Sometimes I Dream That I’m Sick”. In 1995/96 she toured nationally and internationally with her second solo “Stretching My Skin Until It Rips Whole”. 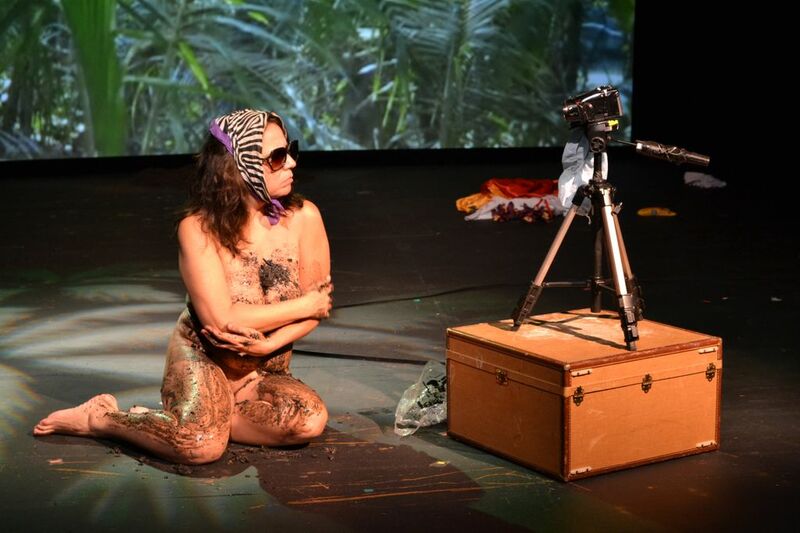 Her newest solo work “First Woman on the Moon” was featured at the First International Latino Theatre Festival in Los Angeles and at the First Performance Art Festival in Chile. A dual citizen of Costa Rica and the United States, Arce is based in the California desert. Performance artist Elia Arce conducts an investigation of space, movement through it and the claiming of one’s own. Through the use of her body, language, sound and visual images, Ms. Arce leads us through a series of places both physical and emotional, from the dark, lush jungles of her Costa Rican roots to the barren, lunar landscape of her adopted desert home. Ms. Arce’s nomadic journey to the center of the self is met with obstacles at every stop along the way, until she claims the space that she can put a fence around and call her own. First Woman on the Moon is a National Performance Network (NPN) Re-Creation Fund Project sponsored by MACLA in partnership with DiverseWorks, Links Hall and NPN. The Re-Creation Fund is supported by the Doris Duke Charitable Foundation, Ford Foundation, and the National Endowment for the Arts (a federal agency). For more information: www.npnweb.org. First Woman on the Moon was originally commissioned in 1991 by the Santa Monica Arts Commission, the Durfee Foundation and Highways Performance Space.